Prints and Photographs Curator, Beverly Brannan, shares with us her expertise and great insight into the photographs of the Farm Security Administration (FSA) and Office of War Information (OWI). These photographs form an extensive pictorial record of American life between 1935 and 1945. 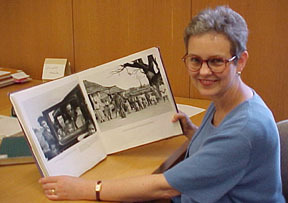 The U.S. government photography project was headed by Roy E. Stryker. The collection contains approximately 107,000 black-and-white photographic prints, 164,000 black-and-white film negatives, and 1,610 color transparencies. Q. 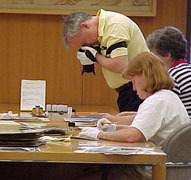 How would you describe the work you do as a curator with the Library of congress? Beverly: My role is to tell the history of the American people, to know the collections here and at other institutions, the significance of pictures and how they fit symbolically, and bring new understanding to images. Jack Delano, Farm Security Administration/Office of War Information photographer, 1943. Children playing "ring around a rosie" Chicago,Illinois, 1941. Q. Who were the photographers of the FSA/OWI collection? Beverly: Because of the economic situation during this time period, a new agency, the Farm Security Administration, was created to help farmers. Photographers were hired into the program as part of the New Deal Era. Their job was to inform the public about the poverty in this country and the increased need to help people. 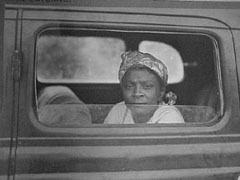 Walker Evans was the first photographer followed by Dorthea Lange who had been doing the same kind of work in California. There were 98 photographers over the course of the project. Q. What is your favorite photograph from the collection? Why? Beverly: One of my favorite photographs is of a woman looking out of the window of a car. It portrays a strong image of a woman. The shape of her face is interesting and one can imagine her being very wise. Jack Delano took this photograph. His mother was a dentist in Russia. When the family came to America there were language barriers, etc. His father had difficulty adjusting so his mother made sure there was income, clothing, and other necessities. Jack Delano came to respect how women found ways to get things done without status, respect, or income. Other photographs in the series show individuals reading newspapers. It made them less alien so you could see the humanity in them. Q. Are there two or three items you wouldn't want students to miss? Beverly: Documenting America is a book about how the photographs were made, how they were used at the time, and how they were catalogued. This book will give context to the material in the classroom. The FSA/OWI is the only collection where you can view film sequences by looking at sprocket numbers. Using these "phonyfiche" you can piece together pictures like a photographic contact sheet. This is useful in finding related photographs that were not titled. Students should also be aware of the portraits of the Photographers that are online. Fleischauer, Carl and Beverly Brannan, ed. Documenting America Berkeley, Ca. : University of California Press, 1988.